Pay Per Click advertising is an effective way of driving relevant traffic to your website quickly. Your ad only appears when a web user has entered a search term that is directly related to content on your website: e.g. 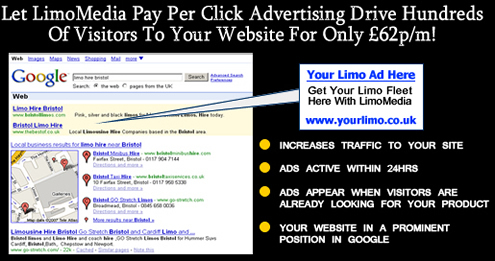 an advert for BristolLimos.com will appear for someone searching 'limos in bristol', but not for someone searching 'limos in London'. This means your ad appears when people are already searching for your product- the perfect marketing tool! Google screenshot of Pay Per Click adverts at top of page 1 of Google. • Your questions answered by phone or email in a jargon-free way! We deliver hundreds of sales leads/conversions every month for our existing clients so let us do the same for you. Programs range from £62 to £200 per month on a 1 year subscription with different levels of coverage, so there is a program to suit all budgets! All regional areas of operation are looked after on a first come-first served basis so call or email us today to ensure you don't miss out to your competitors! Find out more about what we can do in your area of operation by competing this enquiry. We'll give you obligation-free information on what we can do to drive more booking enquiries to you!